I have higher hopes for this partnership than the one they made with Renault. The absolute worst parts of my newer 2018 Smart ED are the (Renault sourced) entertainment and user controls, which are pathetic. Even the drive train is woeful, the acceleration doesn't even match my old 2013 Smart ED, which itself wasn't as fast as most other EV's. Regardless, love my little Smart EV and will be keeping to 2022 and see what's on the market then. Geely is already the largest single shareholder in Daimler. Hi Smart Electric - are you saying in your post that your 2018 Smart ED has less acceleration than a 2013 Smart ED? I have a 2017 Smart ED which I think is the same as the 2018. I have so driven the prior model (a 2016) which I think is the same as the 2013. The 2016 I drove was considerably slower for acceleration than the 2017/2018. 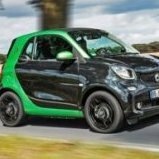 The new (453 chassis based) 2018 Smart ED (Sep 2017 build date) has slower acceleration compared to my old 2013 Smart ED. This is absolutely true, measured and youtubers have videos showing it. It's enough to be annoying. Really though, the worst thing about the performance of the Smart ED is the overly intrusive stability control software that cuts power dramatically on any loss of traction. Daimler is really incompetent on this, I owned a Mercedes SUV prior to trading it for our (Rear wheel drive) Tesla, and the Tesla traction control is light years ahead of the MB SUV. Looks like they’re driving around Lower Baseline Road in Oakville/Milton!